I met the most amazing man. Please delete my profile. Please delete. Have found someone through your service. Thank you. I have found my other half! Thank you. I've found someone through your site, please delete my profile. Please delete my account, I have met the love of my life. Please delete profile as have met someone on your site! It's been awhile, just so you know I met my now husband from Western Match about 6 1/2 years ago. We just got married November 15, 2017. I can't thank you enough for bringing my life partner into my life. Found my cowboy, thanks for the good times! Dear WesternMatch.com. I just wanted to submit a success story to you. I met sidewinder2355 using your service. We are dating and things are going good. I'm so happy to have found him, he brings great joy to my life. I hope I can at another time send you another success story about our future. Until now, having fun. I have taken my profile offline in the meantime. Thank you!! Please delete my account I found someone through your service. I Found someone on your site just in time for the holidays. We are going to take it to the next level. Please remove my profile and thank you for your service. Please delete my account and profile from your system. Not long ago I took my profile off line, however the relationship is moving forward within the Spirit. WM has been and still is very well manage. Thank you to all who are responsible for such and continue to be vigilant in keeping the site attractive to one's participation. Found someone I really care about. I don't need this anymore because I plan to move further with this person. Thank you for letting me use this site. Just have my love of my life I don't see me ever needing this site again. Thank you WesternMatch for your service. I didn't meet my match yet, but I've met a good friend of the same gender. We do fun things together and I never would of met her if it weren't for your service. I'm still looking for my other half. I found my match on here. This site is the best! Found someone on site, please delete! Deleting for now. Found someone. Great site! Delete profile - WHY NOT?? Found a HOTTIE with a BODY!!! I have found my forever mate, thank you for all you did for me. You guys rock. Love your sight. I have met someone special on Western Match. I want to see if it works out. Please delete profile. I have met someone special. Thank you for your help. I've met someone through your service. I've been on WM for 2 years. They say you can't rush a good thing. Well, I think I've found my little lady through your site. Thank you for the use of your dating service. I wish others the best of luck. I joined your service 6 months ago. I didn't really expect nothing to come of it, but I figured for the $15 bucks yall charge for a lifetime membership, I could just hang out for awhile and see what this site had to offer me. Turns out, I met a nice lady on your site. We talked back and forth for about a month. She lives about an hour away from me, which really isn't too bad. Well we've hit it off and would like to see where it takes us. If yall can remove me from this site, that would be appreciated. Thanks again for your service. I will recommend it to my friends. Just wanted to let you all at Western Match know that two of your subscribers met on your site and we got married back in March! I truly enjoyed being a member on your site, it was great and we both met some really nice people. Thanks Again! Hi, my name is Angie. I am writing to you because 6.5 months ago, on January 14th, I met a man with the screen name of gangway1. We met on January 18th in person and have been inseparable ever since. I have 2 children, a son and a daughter. He has a son. They all get along very well which is a great thing because not only did the kids and I move in with him at the end of March, but we are already planning on getting married. The wedding will be held on May 22, 2018 at Chapel at the park in Knoxsville TN. He is the love of my life. I could never see me living another day without him in it. Gangway1 has won my heart over in one of the most difficult times of my life. He is the most thoughtful, loving, respectful, loyal, kindest men I've ever met. I love him so much. Thank you so much Match for finding "the one". Please DELETE my profile. Engaged July 3 to the cowboy of my dreams! THANK YOU WM! I have met someone I would like to get to know, please delete my profile. Thank you for your service. I have found someone, thank you. Please delete my profile. Good site found my cowboy. I have found the love of my life, I have found my forever love. I found the love of my life thank you very much . Found my true love here, thanks! Please delete my profile. Can you remove my profile I have met someone on this site. It's been a great site. Keep up the good work thank you.. Thank you for the opportunity, it was successful. We shall see how it turns out with time. Oregoncowboy0121 and I have hit off. Like rainbows and unicorns haha and I no longer need the services of Western Match. Y'all have a lovely day! Just wanted to say that i came on here with no expectations. After a month of back and forth conversations, there was one particular conversation that peeked my interest. We communicated back and forth for two weeks. We finally met and i must say this ladies pictures didn't do her justice. We are dating now, if you can please take my profile offline while I adventure into this new relationship to see if it works out, i would appreciate it. I want to delete my profile i found the girl i was looking for thanks to yall, but im staying with her so time to delete my account. I found a good Kind hearted man. Thanks for your help. I would like to thank you. I met my husband off of Western match we were married this July on the family ranch with Wyoming mountains as its backdrop and the party in the big family barn. And, now expecting our first little cowgirl. I am living my dream. We live on a ranch in Wyoming. Thank you for helping me meet my cowboy. We would have had never met if it wasn't for western match! Please delete my profile. I have found my forever. I went to Ukraine. Tired of dealing with the attitude of the American woman acting like things are owed to them. They need to learn to work for it I have too. I would like you to please delete my profile due to finding the love of my life. Thank you for helping me find a match. Without your service, i may still be single. First time using online dating, and had a great experience. Thanks again. I would like to delete my profile. I found a wonderful partner, thanks for the help! Thanks WM for having this site. I was skeptical at first, but it really worked for me. I've met a nice man and we're exclusively dating now. So, if you could please remove me from your service, i would appreciate it. August of 2013 I began to talk to the man who became my husband January 2015. We met on westernmatch.com and I couldn't be happier. He is the love of my life and it is all thanks to this website! We lived 400 miles away yet we began to talk but we didn't let the distance stop us from meeting. So, we met, we fell in love and now my life is complete. Thank you for being a part of my love story! I met a wonderful woman.....with all due respect for your web site ,I didn't meet her here. This is a great place with very good people. Thank you very much for posting my profile.....I did not meet my love here but I think you do a great job!! I would like my account deleted. I have found someone I have bonded with. Thank you! Thank you western match, I met my cowboy, site no longer needed. I think i found him. We'd like to give our relationship a chance, but i can not do so being on this site, so please delete my profile. Thank you for such a great service and easy place to meet people. I have found someone special, i no longer need this site. I know longer need your service, i found someone. Thank you! I would like to delete my profile from the site as I have met someone from here, thank you, Dave. Found a mate. Seeing where it leads. Please remove my profile. Thank you for a nice service. BINGO! Met someone through your service and would like to give it a chance. Please deactivate my profile. I want to thank you for your website. I met the man of my dreams in person for the first time December 2013 and we're getting married in May 2015. About seven weeks from now. Thank you again. I would like to delete my profile please . I thank You so much for the wonderful service You provide ,but i recently got engaged and soon to be married so that is my reason for leaving this site . I thank You so much for the help and support and of course for giving me a chance to meet my fiancée . Thanks for finding my special girl. Please delete my account, I found someone amazing here about a year ago and we have continued to develop our relationship into something beautiful. Please delete my profile. I met a wonderful man on the very first day I joined (Valentine's Day) and we're going to see how it works out! Thank you for everything! I've found someone through your service, please remove me and I thank you. Your website has served it's purpose, please delete me. Please take my profile offline. I've met someone through your service, and I would like to see where it takes me. Thank you for your service. thanks I've met a wonderful man and I will not need my profile on here anymore! I've met someone on here. And we're seeing where this going to take us. Thank you for the opportunity to put myself out there after quite a wild. I will be suggesting this sat to Matt friends also. If things don't work out I'll be back. But to give a relationship a chance I can't still be on the site. Found a wonderful woman here , I will be leaving and hope not to be back. Thank you, your website helped me find my soul mate that I have been looking for, for a long time. I live in Washington and she lived in Tucson az, please delete my profile. Please Delete My profile. I have actually met someone thru your website and I cannot thank you enough :) This website was perfect. I had a great experience. I met what I hope turns out to be the love of my life. I've met my cowboy on this site and we are getting married. Thanks to Western Match for finding Jack for me! We have been together almost 3 years and married for 1....who says you can't find love outside your own zip code hasn't tried your site! Met a beautiful person through your site. Thank you for your services. I have found the perfect man....thank you from the bottom of my heart. I have met the one I love! I would like to delete my profile. I have found my partner for life. Thank you. Please delete my profile found a great guy on here and I am very happy. Please delete my account as I have met somebody through your service and we are getting married. Hi WM, just want to let you know that I met someone from your site. We are going to see where it leads, so please delete profile. Please delete my profile. I have met my match. I appreciate your site. Best Wishes! Please delete my profile...I've found the right man. I thank you very much. I am very happy to recommend this site. Many thanks for everything, and keep up the good work !!! Please delete my profile, I have found the cowboy of my dreams on your website. We are taking our relationship to the next level. Thank you! I wish to have my profile deleted from your site, for I have found my perfect match. thank you! I have met my other half on WM! Without your site, I never would have found him. Thank you and please delete my profile. Found the love of my life here!!!! Thank you!!!!!!!! Love him so much !!! I have fallen for the most amazing man, took me a bit to find him but finally I have. 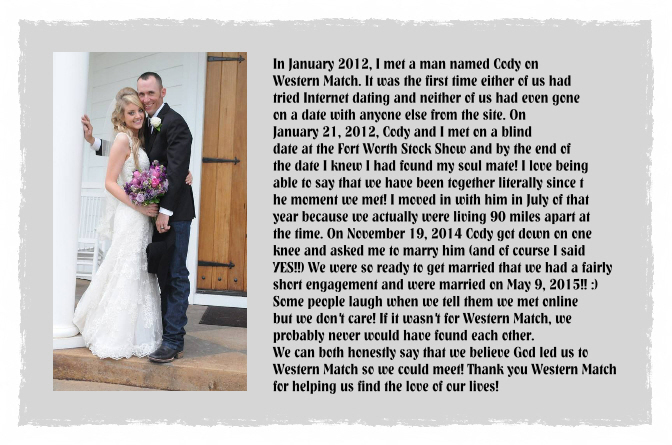 Thanks to Western Match, ya never know when and where you will find that special someone. From the very first message, we can't get enough of each other. I have met someone on Western Match and am very happy. I would like to delete my profile at this time. Please cancel my subscription to this sight it has been fun but I found someone thanks. Thanks for the service I have found someone and wish to delete my profile thanks again. I would appreciate it if you would delete my account. I have found a wonderful woman on this site. I would like to delete my profile I have found someone and don't need this anymore. Thank you for having this website it has helped me find tons of new fun people!! I would like to delete my profile I have met my match on here thanks for such a great service. I have met the man of my dreams through your site, and we are getting married! thank you very much. Thank you for my membership but I need to delete my profile. I have met the woman I have been waiting for all my life. So thank you again for this web site, if not for this site I would have not ever met her. Thank you guys so much! I finally found him! And he found me! Please delete my profile we will no longer need to search for another soul. God bless and happy new year! I would like to request to delete my account please. I have found someone special from the site. Thanks. I am happy to report that I married the man of my dreams who I met on this site back in June 2010. Please remove my profile! I would like to hide my profile please if possible. I have found a very special lady on this site, so hope that it all works out for the best. Thank yall for this site, it is great! Thank you WM for good time, but it's time to leave. I've found THE one. She's a beautiful lady and we want to take our relationship to the next level. I've enjoyed your service but hope I will never need it again. I would like to delete my account. I met someone thru here and do not need my profile anymore. Thank you for the opportunity because I would not have met him otherwise! Thank you WM, it's been a blast. I finally met THE ONE!! Let's hope.. :0) Please take me off your site. Only was on the site four days. Met the most amazing man, thank you. Met a wonderful man on here, we've been together for over a year. Thank you! Super site had a great time . Met alota quality people . Thankyou! I met the Love Of my life, I am happier than I have ever been! Life is just beginning for us and we plan on getting married and having children soon. I am so thankful for this site because I know other wise I would have never met him. He is my everything! I found the love of my life... thanks, its been fun! I found my man on here and don't need the site anymore. Thanks WM! Found the love of my life. Knew her 20 yrs ago, just took this sight to bring us together. Getting engaged to a fabulous guy I met on this site, so excited!! Thanks so much! Amazing site, finally found the one and only been back on this website for a few days:) absolutely love it thanks. We met on WM in February 2012 and we got married in November 2012. Thank you guys! Thank you WM, I met the man of my dreams!!!!! I found the love of my life on WM, we met and one month later we married in las vegas He is my soul mate. Southernokie053 and maggymae. thank you WM for helping usfind each other.